Google launched Chrome Day before yesterday, Looks are fine, Gears make the Speed great yet this is week 1 of chrome in Market so many more things are yet to come. currently no long list of feature is present but whatever is there is nice. first thing what i tried on chrome was about:config ,General configuration panel for browser. well Blank page remain there. so config panel remain hidden yet. 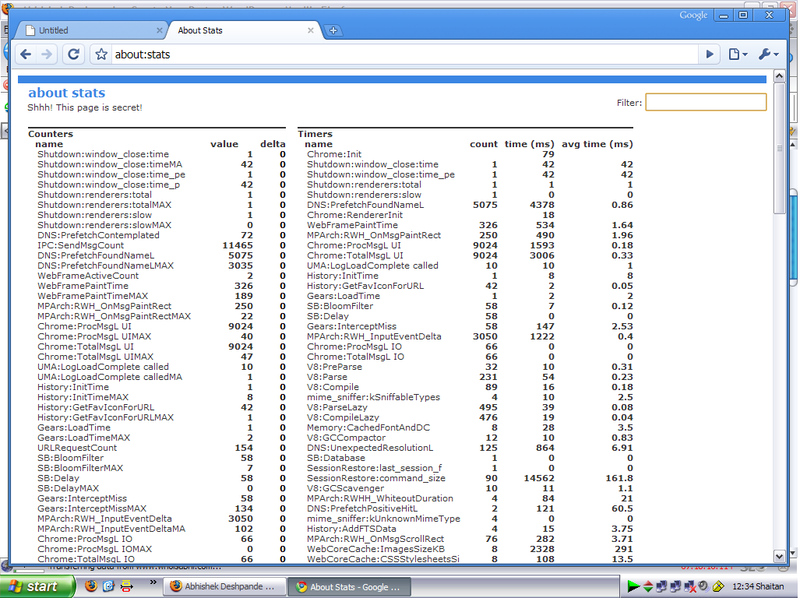 but few tricks like about:memory gives you the task manager in chrome showing tasks in Chrome. Some thing called plugin, An additional utility to browser like ActiveX Plug-ins, Google Gears 0.4.17.0,BitCometAgent , Microsoft Office 2003, Google Update etc are there. Words suggests its all about Chrome version we have on our set. Must be some statistics ?? But its secret. Really lovely stuff I like, Show all the cache stuff links over here !! That’s all yet I found, waiting for Google Chrome’s Official blog to launch. hope we get more info about this upcoming browser !! Hi Abhishek, Am I correct in thinking that Google and this Chrome thing is a new plugin? Is this something we are suppose to be doing? I am lost and I hate (strong wrong to use) working with Google. It seems like I’m forever having problems with them. You must admit they don’t make things easy on the customer. Let’s say not customer friendly, my opinion!! I wish they had phone service…because I’d be right on the phone with them now!. Let me know what I should do to optimize my Google Adsense if you would. You could email if you want and or have time. Thanks so much, you always have great post. Your Friend…. Chrome is web browser not a plugin. a regular browser like Firefox, Internet Explorer , Safari.